Location: South side of Rake Lane. 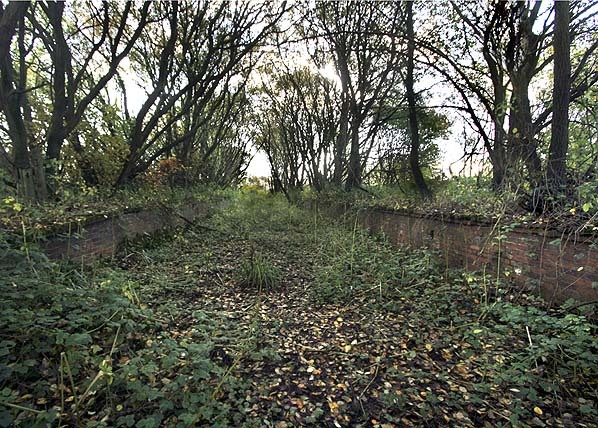 Present state: The Accrington line platforms are intact and overgrown. 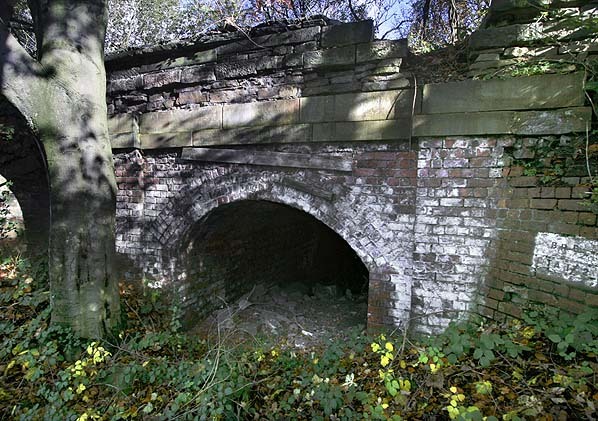 The tunnel under the platforms taking the access drive to Clifton Hall is open on the south side but infilled on the north side of the line. Notes: Clifton Junction station was located at the junction of the East Lancashire Railway’s (ELR) Clifton Junction to Accrington line and the Lancashire & Yorkshire Railway’s (LYR) Manchester and Bolton line. The Manchester and Bolton line had been opened by the Manchester, Bolton & Bury Canal Navigation Railway (MB&BCNR) on 29th May 1838. The company was absorbed by the Manchester & Leeds Railway (M&LR) on 18th July 1846 which changed its name to the LYR on 9th July 1847. The ELR line opened in two stages between 1846 and 1848. Initially the ELR wanted to create a route between Rawtenstall and Manchester. By securing running rights over the LYR into Manchester from Clifton they were able to achieve their aim. They opened a line from a junction with the LYR at Clifton to Rawtenstall on 28th September 1846. In May 1847 a station was opened at Clifton Junction, with platforms on both the ELR and the LYR routes so passengers could interchange between services on both lines. There were four platform faces. The main access was from Rake Lane, to the north of the station. A driveway led down towards a triangular plot of land in the fork of the junction; to its west was the Bolton line, with the ELR to its east. The station building was at the southern end of the driveway close to the actual junction. It was located where the ‘down’ (northbound) ELR platform joined the up (southbound) ‘LYR’ platform, which formed an island platform at the southern end of the station. By the late 19th century a footbridge linked the island platform with the others. This was not built till after 1893. There was also a building on the northbound LYR platform oppsite the main building with a waiting shelter alongside and a tall signalbox at the southen end of the platform that controlled the junction. There was a waiting shelter in the centre of the ELR up platfrorm. 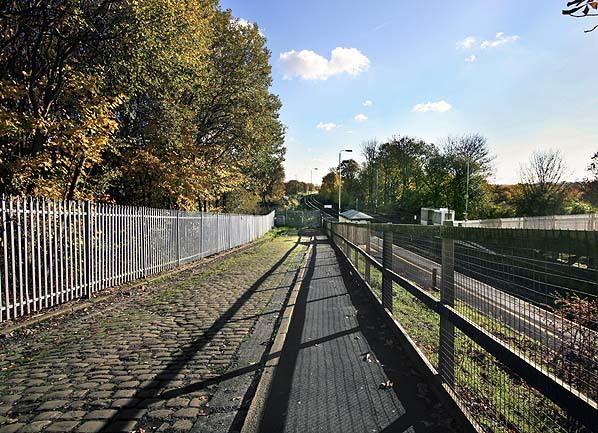 The drive from Rake Lane continued under the ELR platforms to Clifton Hall; this was probably also used as a pedestrian subway for passengers using the up platform until the footbridge was built. The station had goods facilities and a number of private sidings. A line also opened from the ELR at Clifton to the Liverpool and Manchester Railway at Patricroft. It passed in a cutting to the north of the ELR platforms and then went under the LYR platforms. Although principally a goods line it was used by some excursions. At the time of opening the ELR platforms were served by five passenger trains which ran on weekdays in each direction between Manchester and Rawtenstall; there were four trains on Sundays. On 17th August 1848 the ELR opened a route from Stubbins to Accrington. This created the main line from Clifton Junction to Accrington. With the opening of the Accrington line the ELR platforms were also served by trains between Colne and Manchester Victoria. By 1849 there were seven weekday trains to Colne, and six to Manchester which originated at Colne. Four services ran to Colne on Sundays and three to Manchester from Colne. relations between them remained difficult until, on 13th May 1859, the LYR absorbed the ELR. The LYR started to use the ELR route as an alternative to its congested main line between Manchester and Leeds, which brought much extra traffic. The LYR also routed much of its holiday traffic along the line. On 1st January 1922 Clifton Junction became part of the London & North Western Railway (LNWR). One year later, on 1st January 1923, the LNWR became a constituent of the London Midland & Scottish Railway (LMS). southbound direction on the Bolton line there were twenty-two trains, all of which went to Manchester Victoria; the first departed at 05:28 am and the last at 10:45 pm. Twelve northbound trains called at the Accrington line platform. They generally travelled to Colne, but some terminated at Accrington. The first left at 5:27 am and the last at 8:12 pm. Going south to Manchester there were also twelve trains, the first at 5:28 am and the last at 9:32 pm. Many more passenger services simply passed through the station on both lines. trains were even introduced onto the Manchester Victoria to Colne service. earmarked for closure, yet the nearby Manchester – Oldham – Rochdale and the Bolton – Bury Knowsley Street – Rochdale lines were not. Services to Colne were rationalised and cut back to Accrington. By the timetable of June 1965 the weekday Bolton – Manchester services called approximately hourly at Clifton Junction on weekdays and irregularly on Sundays. However the ELR platforms on weekdays handled only ‘rush hour’ services, with two morning northbound and three southbound departures, and two evening northbound (one on Saturdays) and none southbound; there were no calls on Sundays. Goods services were withdrawn from the station on 16th August 1965 although a private siding remained in use after this date. 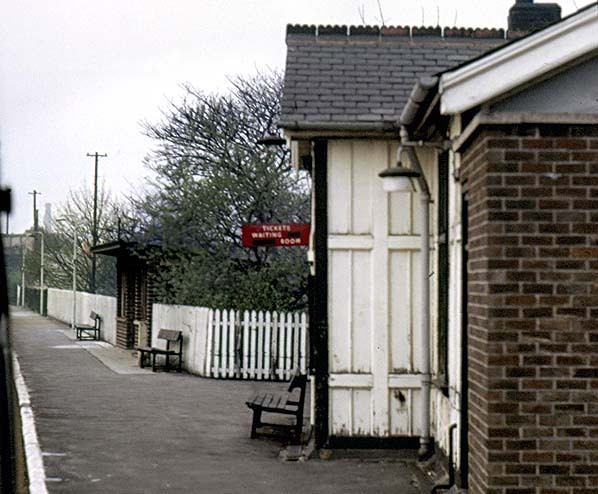 On 14th September 1966 the Minister of Transport gave permission for the Clifton Junction to Bury and the Stubbins Junction to Accrington lines to close, which they did on 5th December 1966, the last passenger services having called at Clifton Junction’s former ELR platforms on 3rd December. 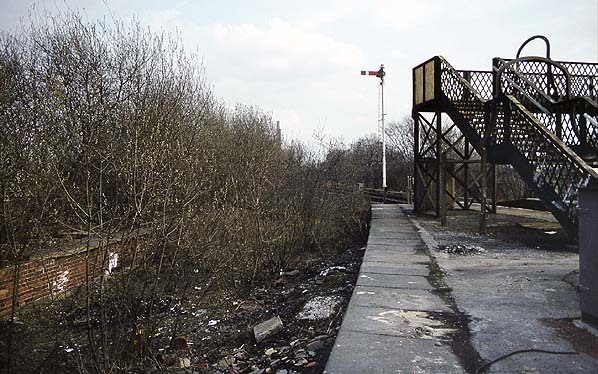 The former ELR line to Bury closed completely in 1968 and was lifted shortly afterwards. Belatedly it was noticed that Clifton was no longer a junction, and from 6th May 1974 the suffix was dropped. is an industrial estate. From May 1992 Clifton was left with a minimal rush-hour service, and from December 2006 its name was removed from the ‘station bank’ in timetables and reference to its single weekday train departing for Bolton at 17:48 was relegated to the footnotes, which only the accomplished (or desperate) timetable user would notice. The May 2010 National Rail timetable lists Clifton in the index and shows it as a ‘limited service station’ in the map for the Manchester-Bolton service, but no trains are shown to call. However on-line rail enquiries indicate that weekday trains call at 07:07 and 17:48 in each direction. 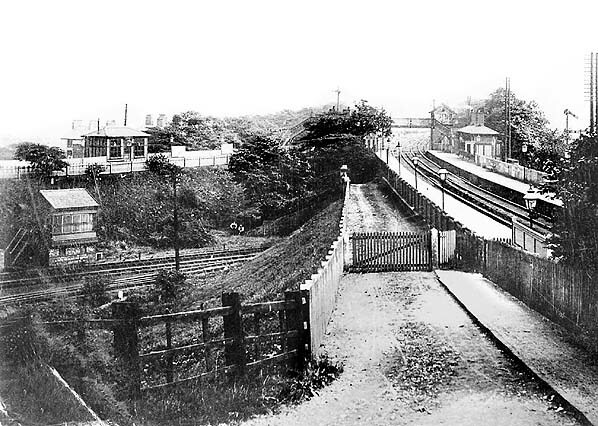 Looking south at Clifton Junction station c. 1910. The picture is looking along driveway which led to the main station building (and under the platforms on to Clifton Hall) which was behind the trees in the centre left of the picture. 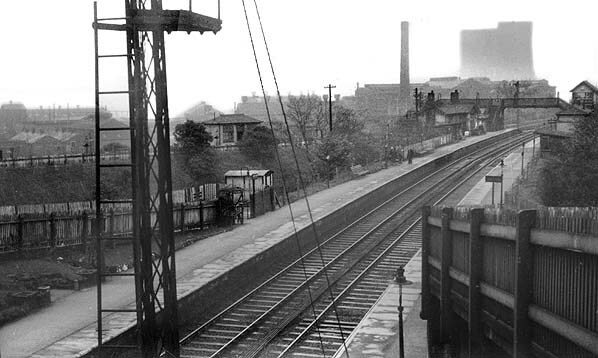 To the right can be seen the platforms that served the Manchester and Bolton line. 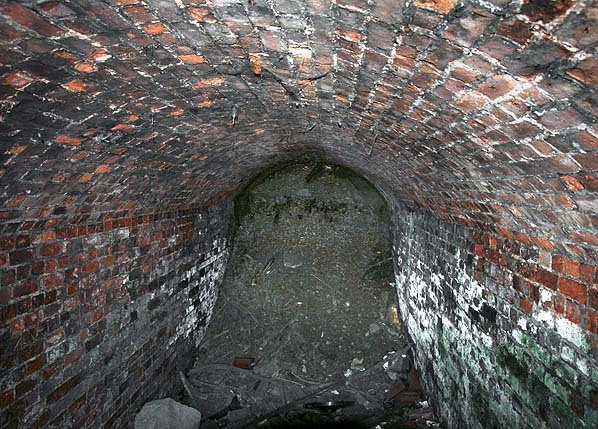 In the bottom left a line can be seen which passes beneath the Manchester and Bolton route. This line ran to Eccles and provided a link between the Accrington line and the Liverpool and Manchester Railway. Above it can be seen the platforms that served the Accrington line. To the left of the picture out of view the Eccles line would have joined with the Accrington route. The signalbox on the left is Molyneux Junction aqnd that on the right is Clifton Junction. Looking southeast at Clifton Junction station in April 1961. The platform to the right served trains travelling towards Bolton from Manchester. To the left is the Manchester platform. 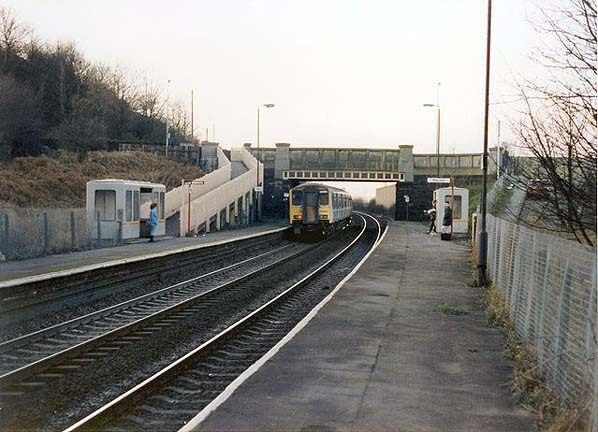 Further left can be seen the platforms that served the Accrington line. The down Accrington platform joined the up LYR platform at the south end of the station. In the triangle created by these platforms was the station's main building. In the distance can be seen a footbridge which linked all of the platforms. This was not there when the station opened but was added towards the end of the 19th century. The signalbox that controlled the junction can be seen far left. 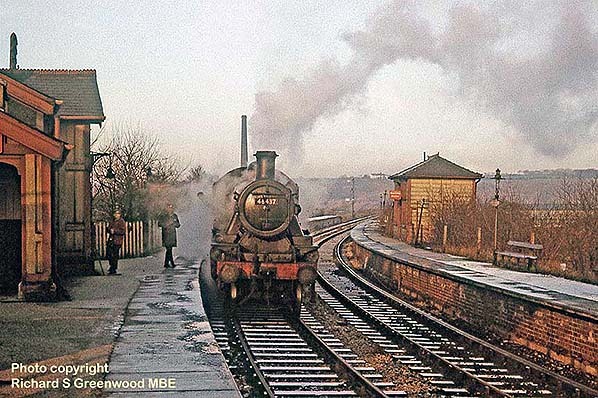 This photograph was taken during the Rossendale Forester Railtour on 3 December 1966, the last day of service on the line. The train, hauled by Ivatt 46437, had to run round and remarshalled with assisting engine 42644 joining at Clifton Junction. The train had arrived from the Bolton direction and then travelled towards Radcliffe Bridge on the original East Lancashire Railway mainline. The ivatt has run ahead on to the Radcliffe line and is awaiting 42644 and train to complete their shunt. 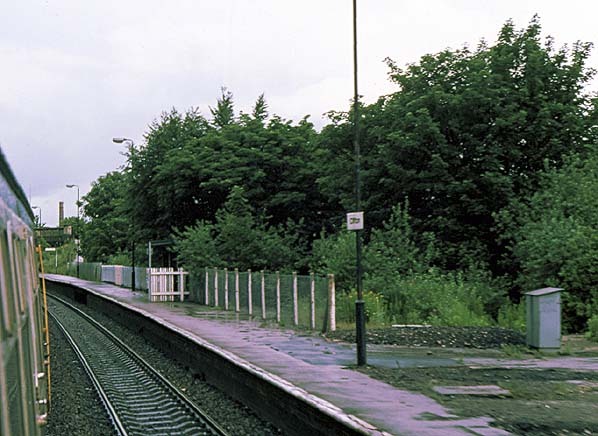 Looking northwest along the up platform of the Manchester and Bolton route at Clifton Junction station in May 1989. A train can be seen heading northwards through the station. By this date the station had been reduced to a simple halt with bus shelters replacing the original waiting shelters. The original cobbled access road can be seen on the right. 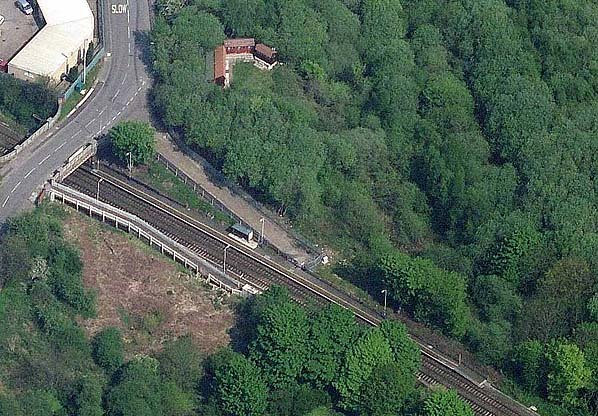 An aerial view of the much reduced facilities at Clifton station. The platforms in the picture serve the Manchester and Bolton line and have been shortened. To the right of the picture in the dense woodland the platforms that had served the Accrington route were extant in November 2010. The original cobbled access road is clearly visible although now truncated. The original cobbled access road from Rake Lane in November 2011. This is still used for acces to the up platform on the Manchester to Bolton line. Beyond the bus shelter the cobbled road has been removedm it used to continue to the main station building close to the junction and also went under the Acrington line platforms to serve Clifton Hall. This is the back of the Accrington line down platform in November 2010. The continuation of the access road went under the platforms to serve Clifton Hall on the far side of the line. Before the footbridge was built in the late 19th century this also probably acted as a pedestrian subway for passengerrs using the up platform. The tunnel is now blocked on the north side.